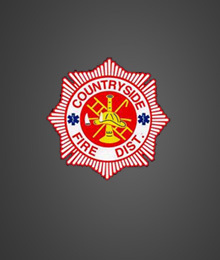 Countryside established the Chaplaincy to provide confidential, non-denominational spiritual and emotional support to firefighters, their families, the community, and victims of fires, medical emergencies, or natural disasters. Chaplains can assist in providing comfort and counsel to injured or displaced persons and their families, visiting members of the departments and their family members who are hospitalized or ill at home, responding to the hospital when a firefighter has been seriously injured or killed and helping District chiefs to notify family members in the case of serious injury or death, participating in funeral or memorial services, counseling, and making death notifications with the Medical Examiner’s personnel. Chaplains also participate with District personnel in other special events as well as day-to-day fellowship through regular station visits. Chaplains must either be a licensed minister of a local congregation or a full-time student enrolled in a recognized theological degree program. Chaplains volunteer their time to the District in addition to their regular responsibilities as local ministers or students. The duty chaplain on call can be notified by Countryside’s dispatch center at the request of the District’s command staff. More information on chaplaincy programs can be found by visiting the Federation of Fire Chaplains.